Save up to 67% on a subscription to a leading creative industry magazine. Get a subscription to one of the world's best creative industry magazines – and save a fortune while doing so. Our range of magazines cover all areas of design, from illustration to web design, and 3D art to graphic design, so there's something for everyone, regardless of skill level. What's more, there are currently some amazing deals across all of our design magazines. This means that you can save up to 64% on some magazines for yourself or as a gift. To start claiming these savings, all you have to do is head over to the MyFavouriteMagazines store. When you subscribe to one of our design titles you can expect up to 13 issues from the magazine per year. They're the gift that keeps on giving! Packed with value and expert insight, the full range of design magazines, which you can explore below, are just what the designer in your life is looking for. All of these magazines are sister titles to Creative Bloq, which means that their articles and features are all written by experts in their field. Computer Arts connects you to the global design industry. Packed with insight and inspiration, it helps you solve daily design challenges with invaluable peer-to-peer insights and advice, and brings you up-to-date on the latest trends, styles, techniques and approaches, so you can produce better work. Save up to 66% on a Computer Arts subscription now. 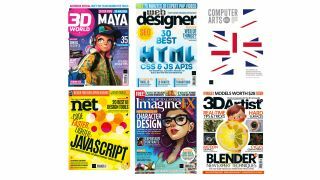 3D World is the planet's best-selling magazine for CG artists, covering the fields of animation, VFX, games and arch-viz. Every month, you'll enjoy brand-new tutorials written by some of the leading creators in CG, providing practical guides to help you create amazing artwork or animation and explaining essential techniques to help you develop your 3D skills. Save up to 67% on a subscription to 3D World right now. ImagineFX is packed with in-depth workshops from the world's best fantasy and sci-fi artists, plus galleries and interviews, community news and product reviews. Whether you're a professional artist, an art student or just create art for a hobby, ImagineFX is filled with advice from our team of world-famous artists. Save up to 65% on an ImagineFX subscription here. From expert tutorials covering the whole pipeline to incredible industry-led features on the likes of Pixar and Blur Studio, 3D Artist is the ultimate monthly magazine for 3D students, enthusiasts and professionals. Plus as a subscriber to 3D Artist, you have access to hundreds of creative resources like 3D assets, plugins, Photoshop assets, and video tutorials for free! Save up to 64% on a subscription to 3D Artist now.